See those two beautiful ladies in the photo with me? Those are my two sisters. Women I simply adore, and couldn't live without. Well, for 7 years I lived all the way across the country from them. And although I loved living in Massachusetts...being away from my sisters - my lifelines - was one of the hardest things I have ever had to do. We would talk on the phone...but it could be challenging. With 13 kids between the three of us, conversations were often interrupted by little ones demanding our attention. (Have you ever noticed that kids have a built-in radar that alerts them the minute mom picks up the phone?) But we tried. 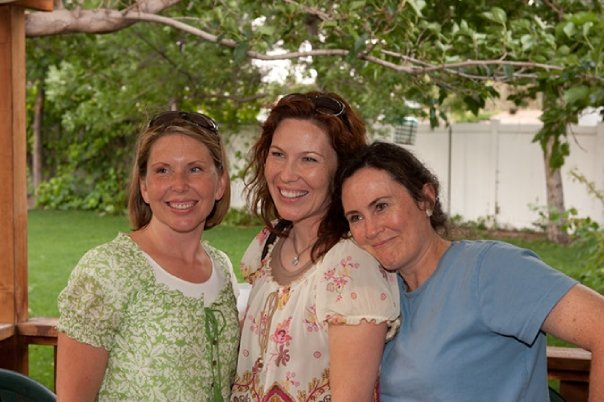 Then one day my sister, Kelly (the one in the blue), hit on the idea of email. OH YEAH, email! Hello? We don't live in the dark ages, you know. Technology to the rescue!! And since my other sister Holly (the one in the middle) still lives two states away, email is still a vital form of communication for us. And, to be honest, even though Kelly and I now live in the same state, we still email one another constantly too. It's amazing, isn't it? The ability we have to communicate with someone by typing out a message and pressing send? Thank heavens for email...and for sisters who are smart enough to use it. This post was sponsored by Yahoo! Through CleverGirls. The opinions expressed are 100% mine. My sister and I do lots of emailing also. Lucky for us we only live a few hours away from each other. My sister and I are struggling right now to keep a relationship going while we are taking care of our Mom with Alzheimer's. You've made me want to try a bit harder. I can't even remember life without email! What did we DO without it? I love your blog. On this post, I have to know where you and your sister, Holly, got your shirts. They are so pretty.